What do parents say about MSC High School? Tell us your stories! Be proud of your MSC days! Leave a reply or write to newsletter@msc.edu.ph to tell us where you are now, or to tell us about your MSC memories! On Dec. 4, 2014, we will be celebrating our 25th Foundation Day. In line with this, we have lined up many activities leading up to the Foundation Day celebration. We invite all to forward and share this newsletter 25 Math Short Cuts to friends in the MSC community to disseminate information about the event. Every week, we will also feature a very useful math technique, a bit of MSC history, and MSC today. Booklat Isip, Inc. aims to build community reading rooms – a Silid Booklatan – in every barangay in the Philippines. MSC Institute of Technology, Inc. and Kiwanis Club of Buklod-San Pablo are community partners for Silid Booklatan-San Pablo City. Silid Booklatan San Pablo and community partners MSC and Kiwanis Club promote reading by providing venues, reading materials, activities and support. Unexpectedly, I realized that Mental Math is always useful, even when haggling with dried fish vendors! Exploring the MSC Green Campus – It’s Moth Week! We have busy bees exploring the MSC Green Campus. Specifically, we have a very Busy V (let us agree to use the name Veronica, to refer to this Busy V) doing the exploring, and documenting the rich flora and fauna found in the garden campus through her special blog site Busy Bees. Is it a bird? Is it a plane? It is an arctiid moth (looks similar to Alona lactinea) in the MSC Campus! Is it a bird? Is it a plane? No, it is a moth found in the MSC Green Campus! Our Busy V reminds us that it is almost Moth week! ( yep, Moth, not Math ) with this beautiful moth picture. Introducing MATH-Inic – Math Made Fun, Fast and Easy! 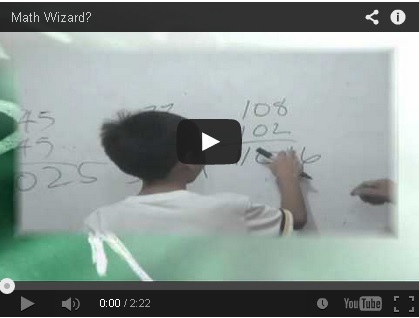 Can your child mentally calculate problems like these in less than one minute? Even a grade school student can mentally solve these after only a few hours of MATH-Inic classes! MATH-Inic is a series of special Math courses that combines the best of speed arithmetic and mental math techniques to enhance math learning. It introduces fun, fast and easy ways of computing Math problems and enriches traditional Math classroom lessons through new solving techniques. Some people consider the first three shortcuts too easy, since they involve only addition and subtraction. But one must admit, any multiplication beyond the simple multiplication table is really cool and amazing, and done with some showmanship, is in the realm of the Mathemagical. Multiplication with a power of 10 is trivial ( just add zeroes, right? ), so let us proceed to the simplest multiplication trick – Multiplying by 11. This entry was posted in MATH-Inic, Newsletter and tagged 25 MSC, 25 MSC Newsletter, 25th Foundation Day, busybees, busyv, Math short cuts, MATH-Inic, memory techniques, MSC, msc advantage, MSC Green Campus, Silid Booklatan on July 13, 2014 by mscadmin. Booklat Isip, Inc. (BII) is a non-profit organization that promotes a lifestyle of reading in order to build a nation of readers. They work with community partners to provide venues, reading materials, reading-related activities, support, and encouragement to members of communities in underprivileged areas. 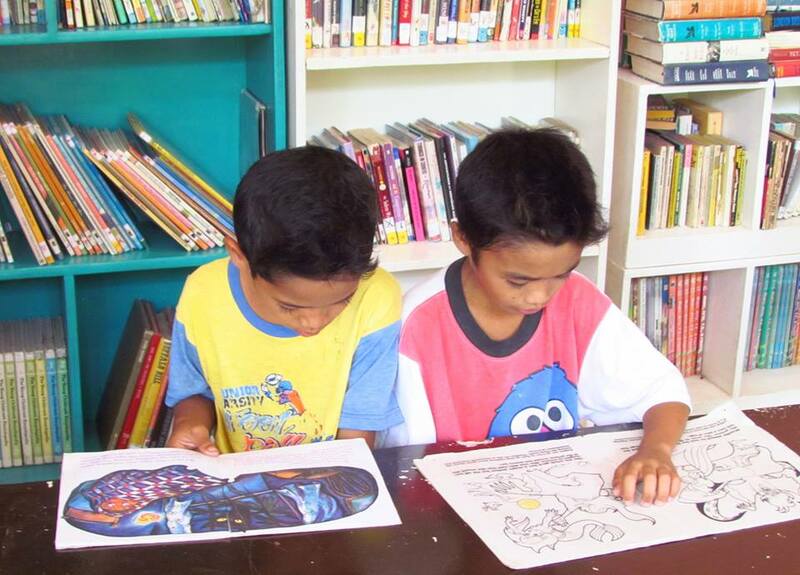 It is their goal to build community reading rooms – a Silid Booklatan – in every barangay in the Philippines. MSC Institute of Technology, Inc. and Kiwanis Club of Buklod-San Pablo are community partners for Silid Booklatan-San Pablo City. MSC high school and technical-vocational students regularly devote time to keep the Silid Booklatan premises clean and its wide array of reading materials organized while the Kiwanis Club of Buklod-San Pablo conducts education programs focusing on children 12 years and below. From December 2012 up to the present, the Kiwanians have been holding Read-Around-The-World projects and Big-School Readiness, and Math Remediation programs in Silid Booklatan-San Pablo City with neighborhood children as participants. Silid Booklatan San Pablo is located inside the MSC Green Campus in Barangay San Gabriel, San Pablo City, Laguna. Architects from the UAP Diliman chapter designed its beautiful open-air-structure that blends in with the environment, and maximizes the natural light and ventilation. Definitely a place that will make you want to sit down and read! The main target reading audience is the elementary school children from public schools near MSC. Then secondary reading markets are the senior citizens looking for a place to hang out, and the moms with their 6-and-below kids. “Silid Booklatan” is a play on the words “silid-aklatan” (room of books, or library in Filipino), and “buklat,” which means to open or turn pages of a book. With Silid Booklatan, Booklat Isip, Inc. hopes to open up a world of opportunities for people who otherwise may not have them. Their hopes are embodied in the tagline “Buksan ang isip, buksan ang mundo“—literally, open your mind, open the world. Studies have clearly shown that better reading skills lead to better job opportunities and greater chances of success. Literacy is also linked to higher self-esteem. In surveys cited by the National Institute of Child Health and Development in the United States, about half of teens engaged in substance abuse and half of those with criminal records have poor reading skills. Reading encourages a curious mind, and helps build brain ‘muscle,’ develops creativity, and makes it easier to learn all throughout life. Reading gives an individual power and freedom. It has been said that there is no progress for a nation that does not read, and the Philippines, despite its claim of one of the highest literacy rates in Asia, is tagged as a nation of non-readers. Several factors contribute to this, but two major ones are lack of access to appropriate reading materials, and lack of motivation to read, beyond any required reading. These two reasons are what Booklat Isip aims to address. The first Silid Booklatan was opened in Barangay Fort Bonifacio on November 24, 2012 while the second one opened its (revolving) doors to the communities of San Gabriel, San Miguel, and San Bartolome in San Pablo City, Laguna on December 5, 2012. Silid Booklatan – San Pablo City started with only two donated bookshelves and kiddie tables and chairs, a loaned coffee table and chairs, and a couple of mats. After one and a half years, generous donors have donated thousands of books, hundreds of magazines, and a couple of shelves, tables and chairs. The wide collection of storybooks, fiction and non-fiction books are mostly sent in from the United States. Books are collected from several public libraries and donors by Mrs. Mary Sabbatino of Mercy League, Mercy Medical Center, Rockville Center in New York and then shipped to the Philippines by Mr. Sergio Javier and Mr. Geng Prudente. To date, around 10 balikbayan boxes full of books were already received by Silid Booklatan-San Pablo City through the efforts of Mrs. Sabbatino, Mr. Javier, and Mr. Prudente. This entry was posted in MSC, MSC Green Campus, Projects and tagged Big-School Readiness, Booklat Isip Inc BII, Geng Prudente, Kiwanis Club of Buklod-San Pablo, Mary Sabbatino, Math Remediation, Mercy League, Mercy Medical Center, MSC Green Campus, msc institute of technology, Read-Around-The-World, Sergio Javier, Silid Booklatan, UAP, UAP Diliman on July 13, 2014 by mscadmin.